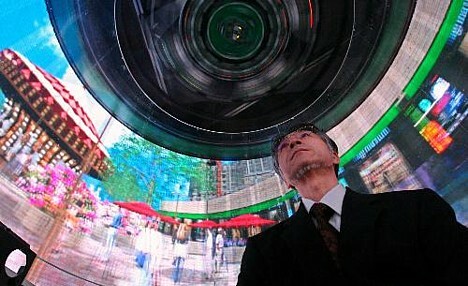 A research team led by Susumu Tachi from the University of Tokyo has developed a rotating panoramic display that immerses viewers in a 3D video environment. 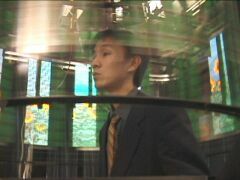 The Telexistence Wide-angle Immersive STEReoscope, or TWISTER, is the world's first full-color 360-degree 3D display that does not require viewers to wear special glasses, says professor Tachi, who has spent over 10 years researching and developing the device. 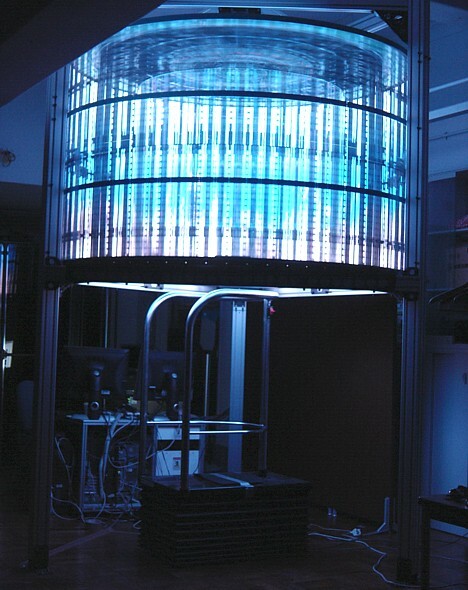 Inside the 1.2 meter (4 ft) tall, 2 meter (6.5 ft) wide cylindrical display are 50,000 LEDs arranged in columns. As the display rotates around the observer's head at a speed of 1.6 revolutions per second, these specially arranged LED columns show a slightly different image to each of the observer's eyes, thus creating the illusion of a 3D image. In other words, TWISTER tricks the eye by exploiting what is known as "binocular parallax" -- the apparent difference in position of an object as seen separately by the left eye and the right eye. For now, TWISTER is capable of serving up pre-recorded 3D video from a computer, allowing viewers to experience things like virtual amusement park rides or close-up views of molecular models. However, the researchers are working to develop TWISTER's 3D videophone capabilities by equipping it with a camera system that can capture real-time three-dimensional images of the person inside, which can then be sent to another TWISTER via fiber optics. 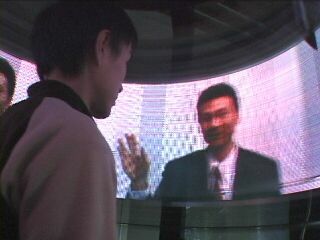 In this way, two people separated by physical distance will be able to step into their TWISTERs to enjoy real-time 3D virtual interaction. However, given TWISTER's size, the first order of business might be to figure out how to fit it through your front door. Leave it to the etherially minded Japanese to be the first to dream and develope this kind of future minded technlogy. It may not take off on it's own, but at the very least this will open the imaginations of other developers of similar technology to further the idea into fruition. This is very ground breaking technology that very may well power the visual element of our future. This is quite a futuristic technology and together with holographic developments is bound to become commonplace in the future. Indeed, there's a direct correlation between the understanding the nature of light (and consequently its manipulation and applications) and the advancement of civilisation right from the start when religion decreed that white light was pure because it was white. I wish I were young again! Quantum Mechanics and Electrodynamics is such a wondrous theory and so true!